Make the secure connection with Topaz’s comprehensive line of Schedule 40 and Schedule 80 PVC products. Fabricated from rugged, rust proof PVC, our ENT Slab Box with Connectors features multiple hubs for easy access. 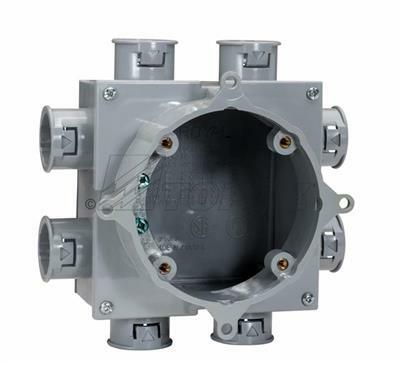 Designed for optimal durability to withstand a tough poured wall environment, code compliance and easy installations; boxes are available with 8 X 3/4” and 4 X 1/2”/4 X 3/4” knockouts. Concrete tight; cULus approved and always ready for fast delivery.